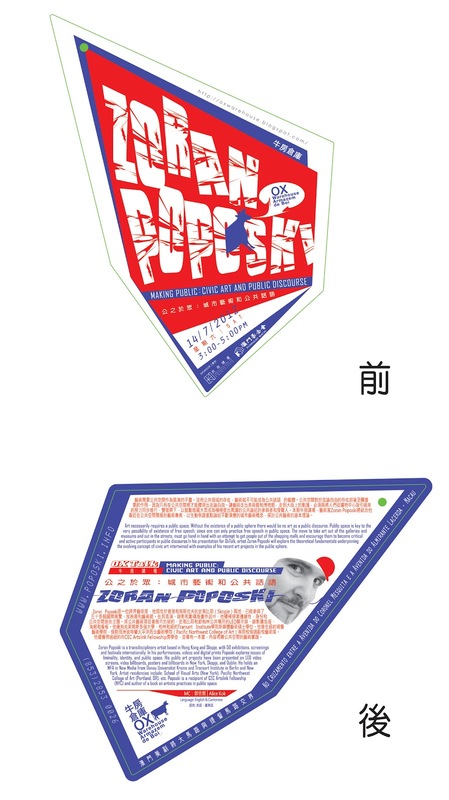 本期牛房講場，藝術家Zoran Poposki將結合他最近在公共空間開展的藝術專案，以生動例證重點論述不斷演變的城市藝術概念，探討公共藝術的基本理論。Art necessarily requires a public space. Without the existence of a public sphere there would be no art as a public discourse. Public space is key to the very possibility of existence of free speech, since one can only practice free speech in public space. The move to take art out of the galleries and museums and out in the streets, must go hand in hand with an attempt to get people out of the shopping malls and encourage them to become critical and active participants in public discourse. In his presentation for OxTalk, artist Zoran Poposki will explore the theoretical fundamentals underpinning the evolving concept of civic art intertwined with examples of his recent art projects in the public sphere. Zoran Poposki is a transdisciplinary artist based in Hong Kong and Skopje, with 50 exhibitions, screenings and festivals internationally. In his performances, videos and digital prints Poposki explores issues of liminality, identity, and public space. His public art projects have been presented on LED video screens, video billboards, posters and billboards in New York, Skopje, and Dublin. He holds an MFA in New Media from Donau Universitat Krems and Transart Institute in Berlin and New York. Artist residencies include: School of Visual Arts (New York), Pacific Northwest College of Art (Portland, OR), etc. Poposki is a recipient of CEC Artslink Fellowship (NYC) and author of a book on artistic practices in public space.